Learn At Your Own Pace With Our ACT Prep. We understand that every student learns different subjects at their own pace and in their own way. That’s why Knowledge Guides’ ACT Prep Programs gives students personalized strategies, practice, and techniques to bring out their best scores. And we get results. Most of our students improve their composite scores by at least 4-6 points. Customizing programs to help each student find the best strategies for them. Studying real ACT questions from earlier tests to help students get a good feel for what to expect. Focusing practice activities on specific skill areas that need improvement. Helping students determine the best way to pace themselves on different sections of the test. Proctoring full-length timed mock tests to give students a measure of their progress in the program. Thoroughly evaluating each mock exam and reviewing the results with the student. This includes suggesting new strategies as well as tweaking existing ones as appropriate. 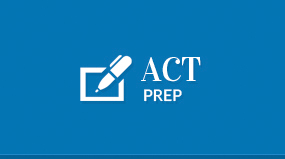 Our ACT programs give students the strategies, practice, and techniques to attain their best scores and achieve their goals. Our individualized programs help each student find the best strategies for them. We work with official study guides (with real content from released earlier tests) to help students better understand the variables of the test. We work with them on finding the best way to pace themselves on the test and help them determine goals for each section of the test. Students work 1-on-1 with their instructor on the specific areas they need like math or reading comprehension. ACT Class meets 2 times per week for 5-6 weeks. 24 hours of instruction. *ACT® is the registered trademark of ACT, Inc. It is not affiliated with Knowledge Guides.